Designed and manufactured by Sensor Technology, LoadSense can be easily integrated within the crane hook. It allows weighing processes to be fully integrated with handling operations. All live data is captured in real time and can be transferred to a database, stored, totalised and analysed. An on-board single chip computer records, analyses and archives readings, while wireless communication capability can transfer data in real time to a host computer. LoadSense employs internal batteries, which make its operation completely autonomous. As such it can be deployed with minimal disruption to mobile harbour crane operations, and will automatically begin transmitting data. No special training is required to install or operate the unit. The LoadSense package includes the intelligent load sensor itself, plus a hand-held receiver display. The load sensor is based on proven strain gauge technology, and is calibrated, as standard in the range from 1 to 20 tonnes, with other ranges up to 50 tonnes available soon. The transmitter (operating on an unrestricted 2.4 GHz waveband) enables accurate load data to be sent to a variety of displays simultaneous, a hand held display, a cabin mounted display, and a receiver connected to a PC. This allows real time measurement of the load at the same time as recording and processing real time values. 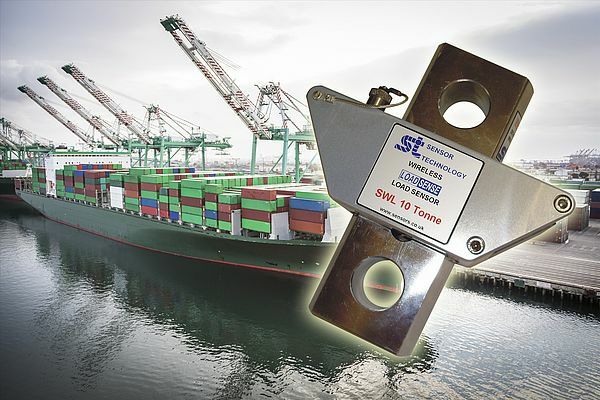 LoadSense and its sister technology, TorqSense, are already being adopted within mobile harbour cranes around the world for dockside unloading operations. They are seen as important enabling technologies for improving safety, while also aiding asset availability by facilitating proactive rather than reactive maintenance. It combines a unique principle of operation with ease of integration and comprehensive data. These same benefits could be a real boon to port operators in meeting the requirements of the amended Solas legislation.